This caught my eye today. Not what I might do, but truly an example of how wonderful artistic and creative urges will move a person. This guy has my vote. I have embarked upon a new craft. This is Japanese braiding. I found lots of links online here and here and using yarn I had squirreled away began making a rope. I’m thinking that I will eventually coil it around, sew it together and have a small foot rug for DeeDude as he sits barefooted at his computer. I also tried it with a small silken cord, but I was so totally bad with it I braided about 2 inches and called it a day. The tools? I had some foam sheets (2 mm thick) and printed out a picture of the kumihimo loom from the internet on a large white label (Airborne Express delivery label) and stuck it on the foam. Then, I cut that out. For the nicks into the loom I did end up curving each a bit because I kept getting the yarn caught. What I think would also be interesting is to use it as a necklace. Not sure how I would handle the ends, though I did scour my local Beverly’s trying to find some sort of finding that would work. No luck there, though I did come home with some things that might work on a different project; they were just too big for this one. But, basically, this is almost a no-brainer to sit there in front of the television at night and knock off a few minutes of Kumihimo. Unfortunately, one of my cats sat at my feet last night and when I next looked one of the yarn ends looked a bit frazzled. In making a rug with this stuff I’m going to need quite a bit, even though it will be a small rug and so I was faced with the task of adding more yarn. I tried to fix it so that they wouldn’t all run out at the same time. I’m working with two colors, white and luscious pink. I did a simple knot and carefully worked it into the braid being careful that the ends stuck into the inside of the braid rather than out. Looks sort of like a boa constrictor ate a mouse, but maybe as I do more of it the joins will look better. I tried to stagger the joins so that they didn’t all end up being worked in at the same time. But, it’s as easy as figuring what the length of your completed project is going to be and multiply that by 4 for the length of cord or yarn you will be using. I just armed it out rather than actually measuring anything. You have 2 strands that go North, East, West and South. You knot the end and that is what will poke down through the hole on your loom. On mine I had white be North and South and the colored yarn go East and West. It really doesn’t matter how you start just so they lay on opposite sides of the loom. Poke each into a slot on the loom. So, you’ve got 2 white strands (in separate slots) in the North position and 2 white strands in the South position. Then, East and West will be 2 strands of the colored yarn in 2 slots next to each other there too. Lift the right North white and bring it down to the right South position. Now, you’ve got one white in the North slot and 3 in the white South position. Go over to the far left South and pick that white up and carry it to the left North position. Now, you’ve got 2 up and 2 down. Turn the disk a quarter of a turn clockwise (or the other way…just be consistent throughout the project). Now, you’ve got 2 colored yarns top and bottom and the white yarns are in the East and West positions. Do it again. Top right to bottom right and then bottom left to top left. Turn loom a quarter of a turn clockwise. And, over and over and over again. That’s all there is to it. This creates a pretty spiral. I read that there are 40 different patterns and a gazillion different variations. The cords are made in Japan using silk. And, although silk is absolutely beautiful I’m going to have to stick to yarn or perhaps to embroidery floss. Also, you can have a kumihimo stand called a maru dai. I looked online an d figured I needed to save my money. Instead, I asked my neighbor Phil to drill me a hole in one of my end tables. With a doily and a lamp on top nobody would ever know that I have my own maru dai. I haven’t tried it out yet, but I just know that it will work fine. I am interested in so many things other than beading. This blog is evolving and expanding into those other interests. Lying at the bottom of my sewing chest are a couple of tatting shuttles. It's been years since I tried making a bit of lace. This, then, to inspire both you and me. Enjoy. And, here's how to do it. And, from every teacher you see you learn a little more. I have these lovely Kenwood KPM-310 headphones. Nice, soft, cushy ear pads. Except, they've gotten old and the soft material covering the ear pads is flaking off. It's pretty disgusting. Imagine this flaky black stuff getting all over your ears, flaking off on your clothes, just disintegrating while you're wearing these headphones that were not cheap to begin with. What to do? So, I'm spending time Googling replacements for these ear pieces, except nobody has anything. I do NOT want to throw away a perfectly good pair of headphones just because the ear pads aren't good anymore. There has to be a solution. There was. I spent the evening crocheting covers for them. I used Lion Brand Kitchen 100% pure cotton, worsted weight variegated thread. This is the stuff that works well for dish rags. It's soft and because it's cotton I'm hoping it won't make my ears hot & sweaty. I used an F crochet hook and in the time it took to watch an episode of, "First 48" with my husband I had them made. Chain 12 and slip stitch the ring together. Chain 1. Yarn over and work 24 Half Double Crochets into the ring. Slip stitch closed and chain 3. Working into the back of the stitches (or not, your choice) do a Double Crochet into the same stitch as the turning 3 chain. Work 1 Double Crochet into the next stitch. Work 2 DC's into the next stitch, and 1 into the next. Alternate like that around the ring. Slip stitch into the top of your turning 3 chain. Chain 3 more. Work 1 Double Crochet into the back of each stitch around. Slip stitch closed and chain 3. Work two more rows with Double Crochet the same as the first row. Try the cover onto your headphones for size. It can stretch pretty good. Tie it off and leave a nice longish tail. Fit the cover onto your earpiece. Thread a large eyed needle onto the tail and weave it all around the edge. Pull it tight and tie it off. 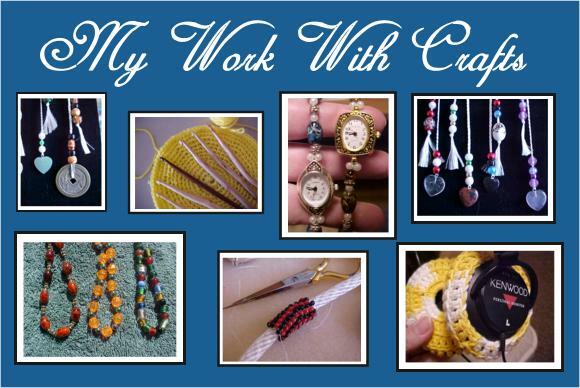 The following photographs are of bracelets that I haven't yet finished. I sat here one weekend and played with beads and made all these lovely combinations. What I'd like is for my sister, Betsy, to have a look and let me know if any of them catch her eye. The next watch I make is for her. This is a watch I just made for a young friend. She said, "Purple and Orange". It's actually quite interesting. What I learned with it was that the safety chain I'd gotten from FireMountain gems that, at first glance, looked too entirely small to use for anything could actually be used if I stretched out the last loop with a pair of pliers. It was a very delicate operation, but I felt quite a lot better that I was going to be able to use the 5 feet worth of silver chain I bought with these watches that I'm making. I am getting a little better at this. With this watch I began beading from the clasp to the watch and I sized it to my own wrist by temporarily anchoring everything with a crimp bead. In the past I've just plowed ahead and ended up being surprised by the fit. So, I'm making progress. What I still need to work on are the half shell clasps covering the crimp beads. No matter how I do them (these are 4mm sizes) I still leave "tooth marks" on the beads from the crimping tool. It's not hugely noticeable, but I know it's going on and it doesn't please me. Practice? Maybe. I sure would like to use the 3mm size half shells, but they are too small to fit over the #2 crimp tubes. I've got smaller crimps, but the once I used them they didn't hold the wire at all. Well, I did it again. I went and bought $74 worth of stuff at FireMountainGems. Yikes. Anyway, what’s coming and the main reason for the order was that I wanted some more silver chain. Got that and why not the rest of it? Right. There’s a reason I quit drinking. I suppose it could have been worse. Anyway, I justified it all by saying to myself, “Hey, I have a job.” However, I do need to remember we also have other bills. I’ll need to get busy at PayPerPost. That’s what I’ve been using for my bead money. Also, in the order is a knotting tool. I’ve been eyeballing them for years. Now, I’m going to have one. I also got a bunch of beads. Some gorgeous Lapis Lazuli 8.5 to 9 mm grade C round beads. I always think that is “my” color…for writing and for speaking and for the work I do spiritually. It’s the blue in the throat charka and I wanted some. It was one of the more expensive things in my order and twice I took it off only to put it back into the cart again. I really wanted them! Anyway, I took the order to 15 items and the price on the Lapis Lazulis went to $7.36 for a 16” strand. I got some head-pins and some more magnetic clasps, some cloisonné beads and then I said I was done. As I went to checkout and signed into my account they found the shopping cart I’d had the last time I’d prepared an order. I didn’t realize that they saved them, so I’ll remember that for next time. In learning how to bead I have found that my creations do not always stand the test of time and of everyday use. Also, I need to learn to be able to gauge sizes for people. But, for now have been concentrating my efforts more towards just getting the pieces to not be falling apart every time I turn around. I've given several away, but I've only actually heard back from one person with her experiences wearing the watch. It has made me think that the other people might also be having trouble with their watches, but for whatever reason have not said anything to me. And, I'm thinking there must be at least something wrong with those watches because I've had trouble with the two I've been wearing myself. So, this is one of those cosmic universe lessons for me. What I should do in my quest to become a good beading artistan is to go and ask the people I gave watches to how they've been holding up. That's me conquering shyness. That's me putting myself on the line and being prepared to take whatever comes my way in the way of negativity (or praise). That's the next step. And, it also points out to me that what I should do when I give a watch away in these early days of me learning this craft is to plainly say to the folks, "I'll be checking back in with you periodically to see how the watch is holding up. I want you to wear the crap out of it and I want to see how it does." This is a watch I made yesterday for a friend. Her favorite color is lavender and, although, all of the beads in this watch are not exactly lavender, they come close. I hope she likes it. Click on the pictures for a "close-up" view. I made this watch with the 49 twist wire. Although I thought I would have more flexibility using the 19 twist wire the little crimp tubes slid all over the place. So, it seems I should stick with the 49 twist. I still need some practice with the half open beads that cover the crimps. Once I am done there are bitty crunch marks on them from the crimping tool. I wonder if there is a way to cushion them while I'm trying to get them closed? Once again I used the silver filled chain as a safety chain. This is more expensive, but it will not stick to the magnetic clasp. All in all, this watch worked up quickly. I got Phil, my neighbor to come over and help me select the beads. He knows what Suzie likes.